The 64b/66b includes a viewing pane and alignment marker, making it easy to identify problems in the system. 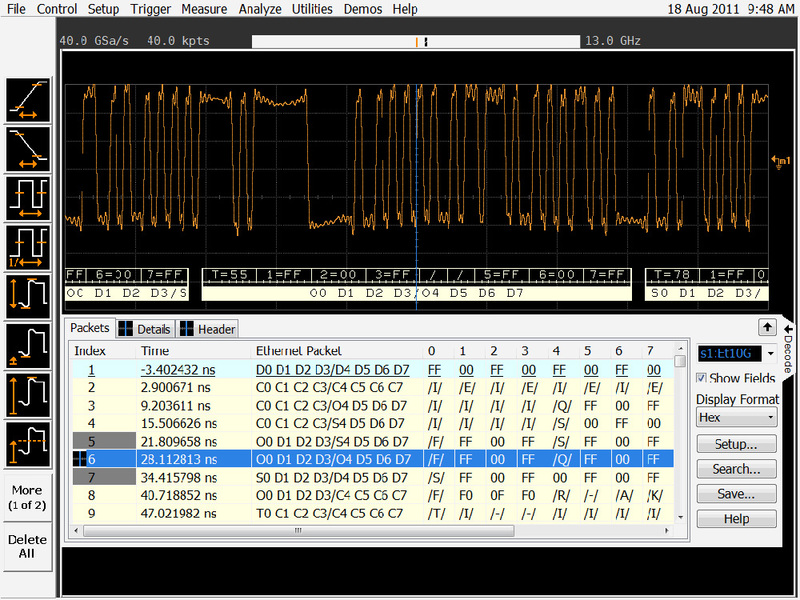 Agilent Technologies Inc. (NYSE: A) has expanded its Infiniium oscilloscope application portfolio with Ethernet 64b/66b protocol decoding and triggering software. Agilent's Infiniium Series is the first and only oscilloscope family to support 64b/66b triggering and protocol decoding. Ethernet 64b/66b is used primarily in today's data networking and transmissions technologies. FibreChannel, Ethernet, and Infiniband are just a few of the technologies that benefit from 64b/66b's lower overhead. Agilent's N8815A software is designed to benefit designers of the 10Gbase-KR and 40Gbase-KR technology defined as IEEE 802.3, which operates over backplane lanes. The new application takes advantage of Infiniium's recently released multiple serial decoding and searching, allowing designers to look at four lanes at once. The N8815A Ethernet 10Gbase-KR decode application is supported on Agilent's Infiniium 90000 and 90000 X-Series oscilloscopes. The Infiniium 90000 X-Series oscilloscope family includes the fastest real-time oscilloscopes with industry-leading, real-time bandwidth of 33 GHz. These new scopes deliver the lowest noise and have the lowest jitter measurement floor in the industry, ensuring superior measurement accuracy. Additional information on Agilent's new Infiniium Series oscilloscopes, ranging from 600 MHz to 32 GHz bandwidths, and the company's complete line of oscilloscope applications is available at www.agilent.com/find/scopes.